Adding An Extra Door Can Make A Difference. Make your building work more effectively for you by adding a side door. Sometimes it is more convenient to quickly open a single door than to open the double doors. Retrieve smaller items quickly. 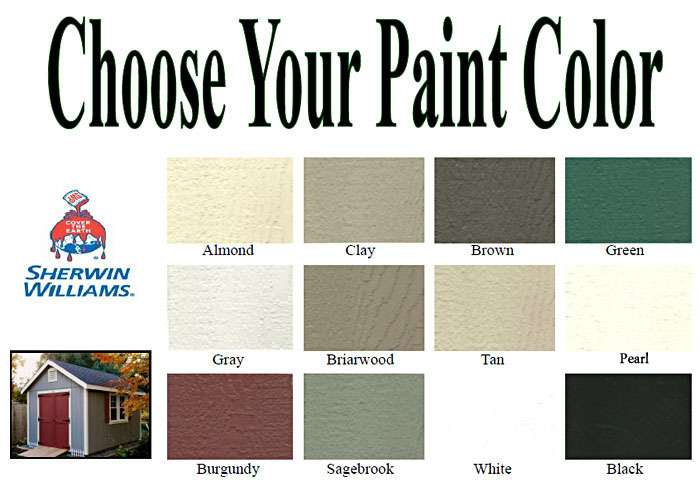 Done in your colors to match the rest of your shed. If you have a partition wall, you can can access one area and keep the other side secure. 3’ single door, 4’, 5’, and 6’ double doors. Classic Look And Weather Worthy! 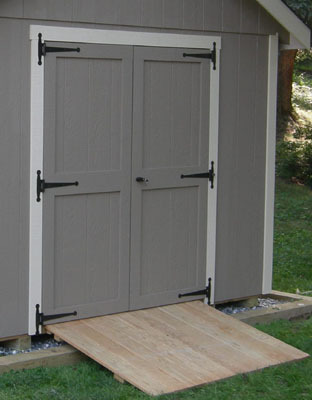 Adding a raised panel door to your storage building will increase its utility and add an extra detail to its looks. If your building is large, the extra entrance is a welcome addition. By including a single side door to your design, you can quickly get to the smaller items you need, while relying on the double doors to access your large items, such as, lawn and garden equipment. Standard size is 36" wide. A Stylish Way to Provide Increased Visibility! 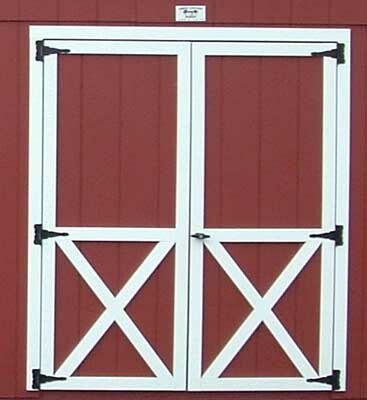 A Lighted Door is a very functional accent to your traditional styled shed. Rich looking raised panels are enhanced by an upper level of window space partitioned by integral dividers. A classic look that will allow increased light to enter your building without taking up more wall space. Standard size is 36" wide. Custom sizes can be ordered. 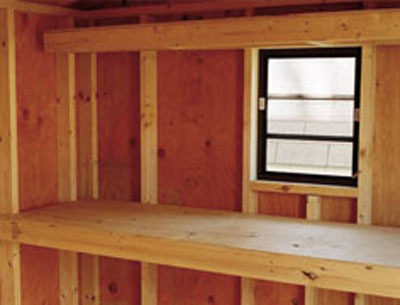 • Combined with higher walls this is an option for individuals concerned with headroom. 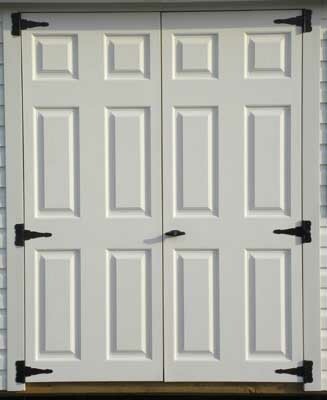 If ease of access is an issue, our higher doors option can accommodate your needs. While providing easier access to your building, increasing the door height makes placing items in and removing them an efficient option. Storage of a variety of lawn, garden, and recreational equipment becomes a real possibility. Taller individuals will appreciate hassle free entrance to their building. Door height can be raised to 76”. Higher walls are mandatory to accommodate these doors. Can be done in vinyl or T1-11. Whether you use your building mainly for storage or as a workspace, adding a garage door can be a real benefit. A large opening makes it easy to place items in or take out, not to mention the increase in natural light when the door is rolled up. 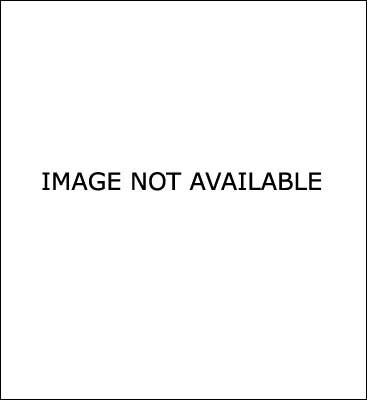 Now you can really see what you need! When its warm, but you need to work under a roof, roll up the door for increased air flow. This is a welcome addition to a multi-functional building. 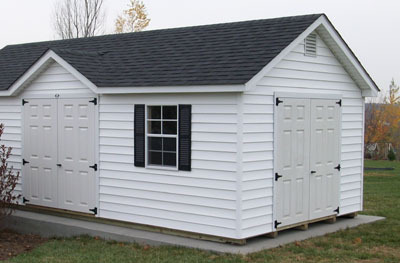 Some of our customers use their ”storage shed” as a workspace for hobbies, such as, woodworking or vehicle maintenance. 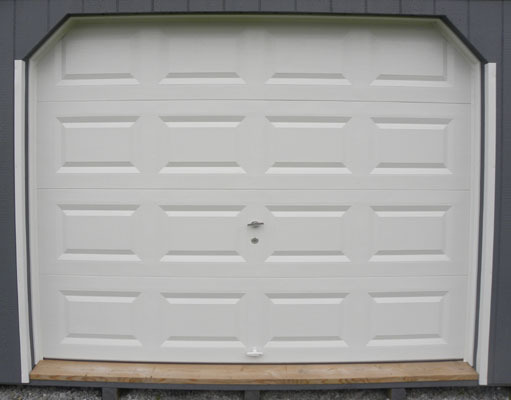 An insulated garage or roll-up door provides an extra measure of comfort during extreme weather, The roll-up feature makes it convenient to bring in supplies or take out completed projects. A great upgrade for your shed or garage. 9’x7’ is standard. Custom sizes can be ordered. If you plan to work inside your building, adding additional windows can brighten up the work area. Because our windows lock securely, your items will be protected. Open up the window to allow more air flow—bug free with the screens that are included. Low Maintenance And A Great Look! 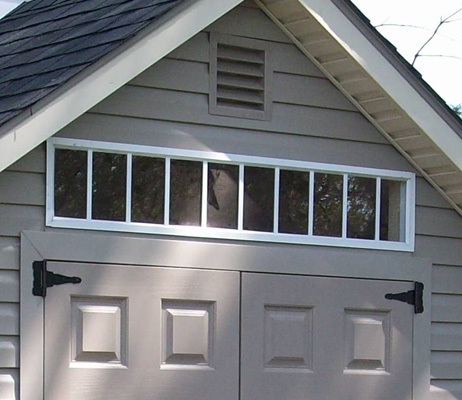 Extend your ability to work inside your shed/garage by adding a smart looking Vinyl Clad Window. 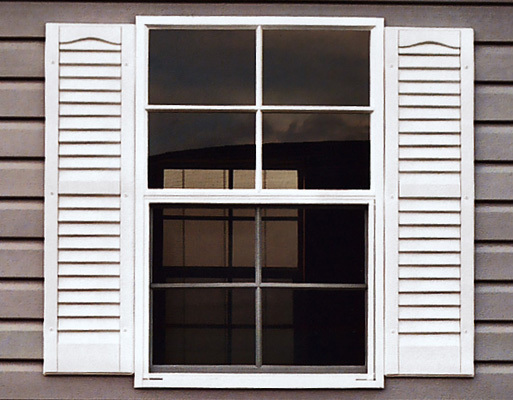 With its integral grids and a choice of a clay or white finish, this window dresses up the appearance of your building, while performing the function of increasing light and ventilation to your workspace. A classic look! Slim Line Provides Extra Light Without Taking Up Much Space. Here is a highly functional architectural addition to your building. Transom light windows can efficiently brighten an area without diminishing valuable wall space. They are perfect for buildings used as workshops. If security is an issue, transoms provide light up high making it difficult to see the contents of your shed. A little light can go along way! Add A Bit Of Country Garden Flavor To Your Backyard! Ok, maybe “practical” is a stretch, but to the gardener in the family it makes all the sense in the world. What better way to display your “green thumb” than to show off your favorite flowers in our Window Flower Boxes? Simple, sturdy, and eyecatching! A Traditional Look to Do A Necessary Function. End vents can effectively help to disperse the heat produce from your roof during the warmer months. 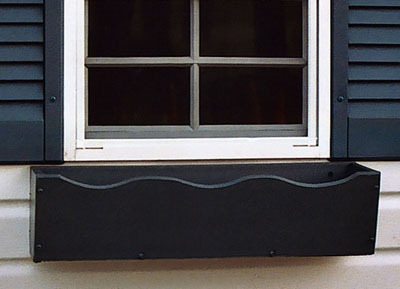 This traditional approach to ventilation is colored to match your siding. The Carriage House Louvered End Vents become an architectural accent on a steeply pitched. 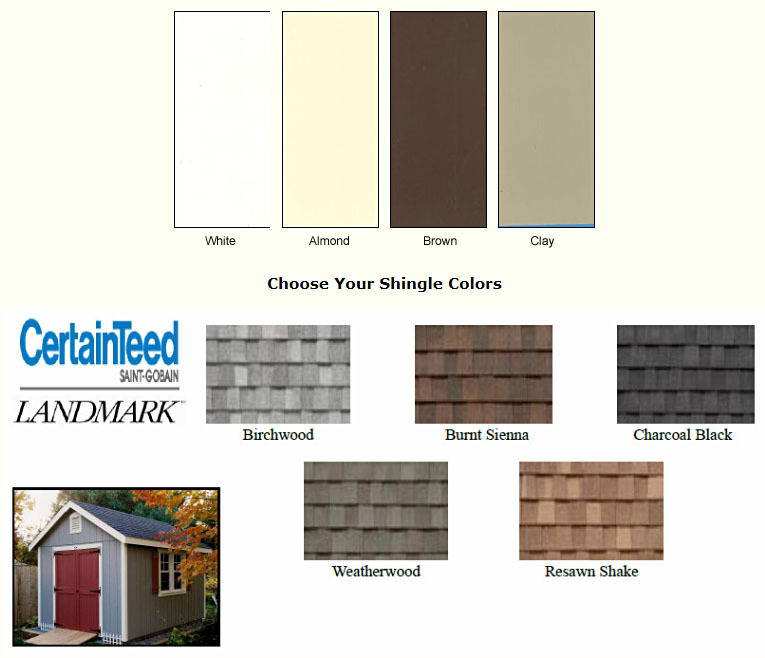 • Blends in with your shingle color. • Disperses heat at the highest point. Vent Your Structure As Part of Your Roof System. Depending on the location of your building, heat buildup can be a problem, especially, if you are storing heat sensitive items. 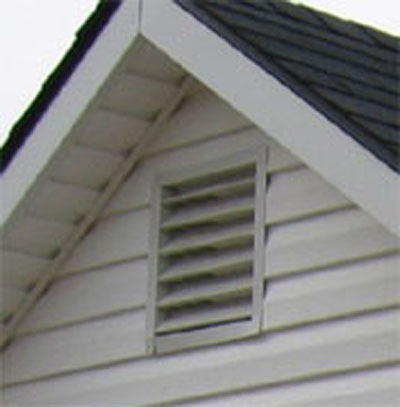 One option is to use a ridge vent system similar to what is used in many house roofs. Our ridge vents have little visual impact and disperse heat at the highest point of your building—important as heat rises. 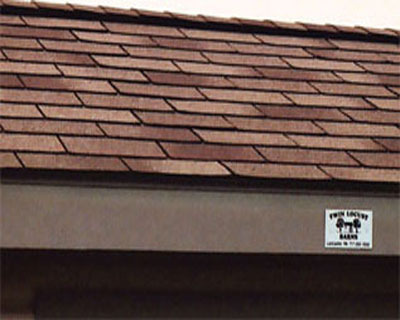 Any of our shingles can have matching ridge systems. Low profile for less visual effect. Matching ridge shingles hide vent. 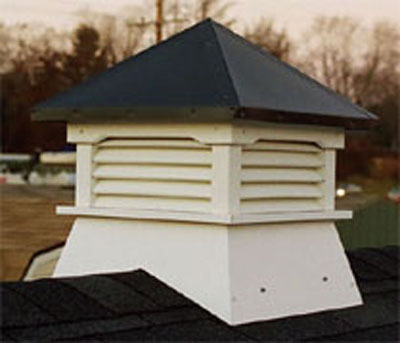 Combined with end vents, a cupola can function to give your building heat relief while enhancing its looks. With a weathervane mounted on top, this is a welcome addition for the hardscape of your yard. 21” by 21” square. Other custom sizes are available. If you plan to work inside your building, efficiently increase available light with a painted interior. 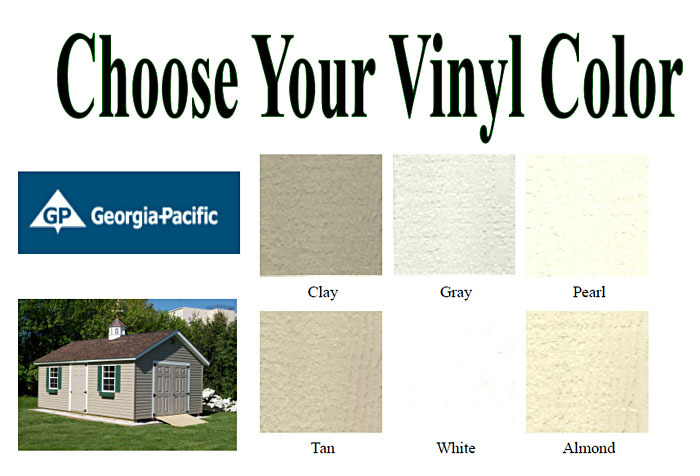 An easy solution to increase the lighted area of your shed/garage is to have it painted—white for best visibility. Put the flashlight away. Now you can more readily see your stored items or the careful work you have been doing on your workbench. An inexpensive add on that can produce tangible results. • Provides increased protection in “soggy” areas. • The peace of mind to secure and protect items prone to moisture damage. If moisture is an issue on your site, having a pressure treated floor could be the answer. Although we always use pressure treated floor joists and runners, your site conditions may warrant even more moisture protection. When damp conditions are your nemesis, pressure treated flooring can provide a greater measure of protection. Storing valuable items ,such as, antiques can be accomplished with greater confidence. Pressure Treated ply wood flooring, 5ply, 5/8” thickness. Available on any size shed. 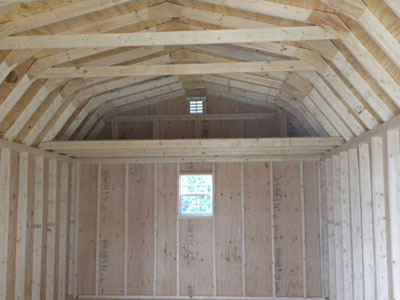 Check the style shed of your interest to determine available sizes. 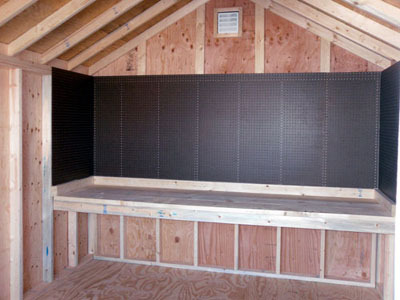 Increase The Storage Possibilities Of Your Shed with Sturdy Shelving. 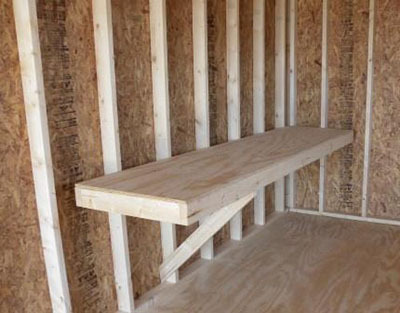 As an option we offer shelving that is installed along the walls of your shed. It can greatly improve the ability to store items that either get lost hanging on the walls or can be better retrieved from a shelf. Whether the “green thumb” in your family has lots of pots and tools or your sportsman needs to clean up his act and organize all those recreational toys, our shelving can provide the extra space you need. Solid wood construction with bracing. Can be placed at any level you need. For The True Hobbiest In Your Family! Working on tasks at a comfortable level can be a real back saver. With one of our sturdy benches you can save the back strain and see what you are doing with greater ease. So, regardless of your main hobby, you can be “in the zone” while working off of your bench! Solid 2x4 and ¾ plywood construction. Normally built at 34” off the floor, it can be built to your needs. Benches are made in 24” widths to your desired length. Extra Storage That Is Completely Out Of Your Way. 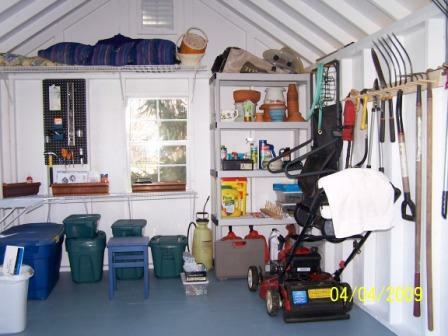 Some people have a limited ground area to place a storage shed, but have a multitude of items to store. Lofts can be an efficient and economic solution. By storing items over head, you will have the floor space for those large items or frequently used equipment that you need to get your hands on. Future building supplies, seasonal items, and things that you just can’t get rid of are safely protected until you want them. Solidly built of 2x4’s and plywood. Build against each end of your building to allow access in between lofts. Available for Big Barns, Cottages, Chalets, and Classic Carriage Houses. Built to the width of your building at wall height to a depth of 4’. • Allows precise placement of tools and materials. • A great way to organize your recreational items. •Flexible—can be modified any time. If Neat And Careful Storage Is A Need, Our Peg Board Wall Systems Could Be Your Answer! Neatniks—and you know who you are—will appreciate the value of peg board storage systems to organize items in an efficient arrangement. The rest of us can give in to organization because of the ease in which you can store and access items that we frequently use. A place for everything with flexibility to adapt it to our changing needs. Solidly attached to the 2x4 studs of your building. Heavy duty peg board for stable storage of items. Many attachment and hanger devices available to suit your needs. A Classic Feature that Efficiently Brings In Natural Light. The dormered roof is an icon of American architecture. Bring that same look to your backyard buildings with a dormer package. Each dormer blends into your roof with the same materials. Originally built to increase light and ventilation, our dormers do the same for you, while adding architectural detail rarely seen on today’s buildings. Make It Easy To Store Larger Equipment With One Of Our Ramps Sized For Your Door Opening. A ramp can be a real labor savor—especially, on your back! Sized to fit the opening of your doors, the ramps can stay affixed or can be unscrewed to be place out of the way. 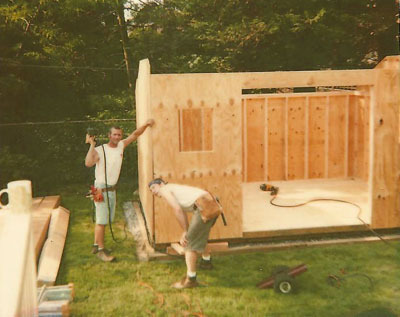 Whether you drive into your shed with motorized equipment or just eliminate the upward and downward step into and out of your building, the ramp provides efficiency for many homeowners or professional gardeners/lawnkeepers. When A Box-like Building Is Just Not Enough! A box is a box is a box….but, a reverse gable changes that predictable look. Is it a shed, or does someone live in there? This addition makes a real architectural statement on your property. This is not for the casual landscape aficionado, but for the enthusiast who wants to make a difference. Do I hear garden party? Relax And Enjoy The View In A Savannah Package Porch! Our Savannah Package add- on provides the eye appeal that landscape conscious individuals really appreciate. Stylishly appointed with lighted window, railing, and contrasting shutters, you will receive rave reviews from guests and visitors. And, it’s not just cosmetics—more light means better visibility for your indoor activities—crafting, painting, potting. Or, pull out a chair onto your porch and enjoy the view of your well designed landscape! • A must if you need to maneuver long items. • Increase the possibilities of wall storage for your garden or recreational equipment. Increase the head room and wall storage of your building without taking up more site space. Sometimes bigger is better when it comes to storing long and ungainly items. Extend your storage with extra vertical space while not impacting the site space that you have available. Smaller structures can seemed cramped, but with higher walls they will allow more freedom of movement for you items. Stretch your storage possibilities for all of your equipment and increase the workspace you need with higher walls. Increases wall height 12” on Cottages and 8” on Salt Box buildings. 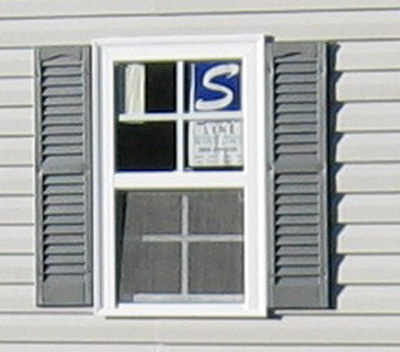 As an option larger windows are available for higher walls. Available for any size shed. Check the style for available sizes. • Have the style and storage you want without disturbing your landscape. •The same quality you would expect from a shop-built building. 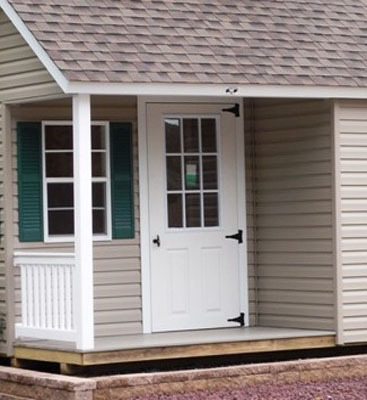 Even if you do not have the space for delivery, we can still provide you with the storage shed of your choice. 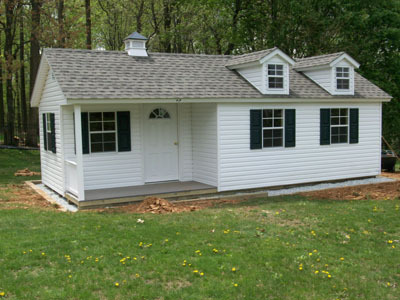 We can solve your storage issues with a shed built on your site. Keeping inconvenience to a minimum, this can be constructed in a single day! 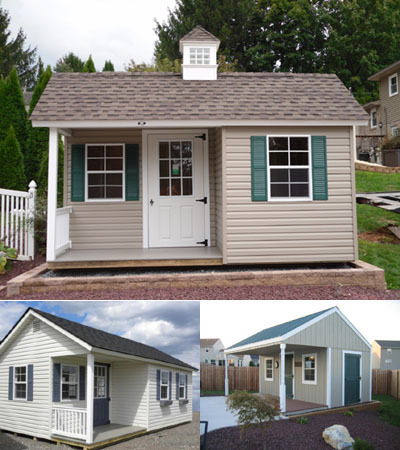 Whichever style you would desire we can produce it with the same quality as our shop-built sheds. Storage, style, quality and convenience in a building that will secure and protect all of your lawn, garden, and recreational equipment.